Remember that time, 2 years ago this month that DanO and I ripped into the outdated tile of the main floor bathroom of this house? And then how, the very next weekend after the demolition started, we found out we were expecting? Yea, it’s kind of like that. Only this time it’s an entire story of my house, not just a bathroom. Last time we checked, there was a gaping hole where my roof should have been, and the sun was setting. 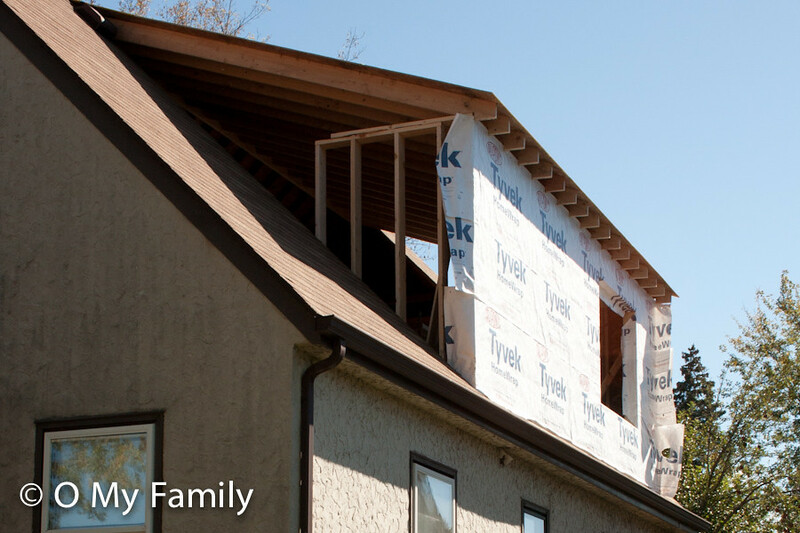 It’s true, we slept under half of a roof that night, but bright and early Saturday morning O My In-Laws arrived and we (very precariously and with much anxiety on my part) raised the first external wall of the dormer addition. Because it’s sitting on top of our roofline some 12 feet off the ground, it was easiest to put the sheathing (that particle board you see on the outside of the wall) on before putting the wall up. 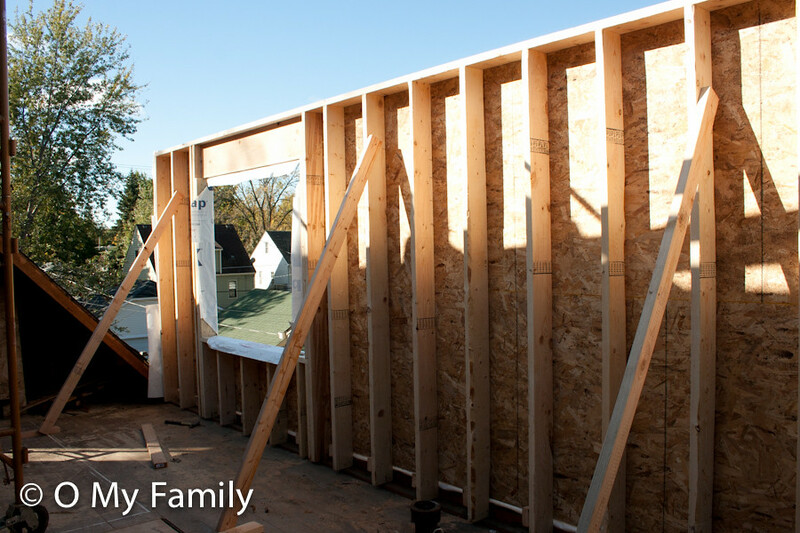 Most walls are just framing and the sheetrock or plywood etc. that constitutes the surface of the wall is added later. Doing it in this order made the wall heavy, which made putting it up tricky. It was laying flat on the ground and we needed to get it vertical, but we needed to get it vertical in the right spot. You don’t just scoot heavy walls into place, I learned. With the first wall in place and with my fear of it tipping over the edge of the house and falling to our yard below unrealized, we could move on to the roof (you know, that thing into which we cut a 400 square foot hole). O My In-Laws had a road-trip to head out for around noon, so for the rest of the afternoon it was DanO, OBaby and I flying solo. Rafter by rafter DanO slaved away while I put OBaby down for a nap. He is now quite proficient at sleeping over framing guns and circular saws, even though the action is literally right above his room. After a good number of rafters had been measured, cut and nailed in place and the afternoon began crawling along, DanO’s brother Paul and his girlfriend came to help and raise the morale. Unfortunately, I don’t have any in-progress pictures of this phase because, get this, I was actually helping. As in, like, wielding a circular saw. I know, right? It was all hands on deck, and although my hands were by far the least skilled and/or helpful, they were needed for the scaffolding dance that was done to get the rest of the rafters and the roof sheathing up. By dinner time, we had a bonafide structure on the outside of our house. That? That is no small addition. Oh! I can’t wait to see before and afters!!!! It looks like it is going to be absolutely beautiful! You totally have a cute house. You probably already know this, but it is a happy thing to marry into a family that loves projects… and finishes them too! I know too many people living in “perpetual renovation.” I would die. haha, you DO use due dates for goals! love it. so, for the record…did you find out that gummybear was coming before or after you started the house? I was impressed that we putting in and finishing a room in our attic – but this is WOW! So handy you two. I thought we were done with house modifications for a while, I figured we would finish the kitchen cabinet doors and take a break of some sort. Nope, now we are working on the kitchen cabinets, a craft room for me(his idea) and yesterday he found a great deal on the same bamboo flooring we used in the kitchen. This time it is for our bedroom. I can’t wait to be done will all of this stuff. Fingers Crossed that our projects are done soon. wooot!!! & I simply love your house. I can’t wait to see the finished product!!! I’m in so much anticipation over here, you’ve no idea!! 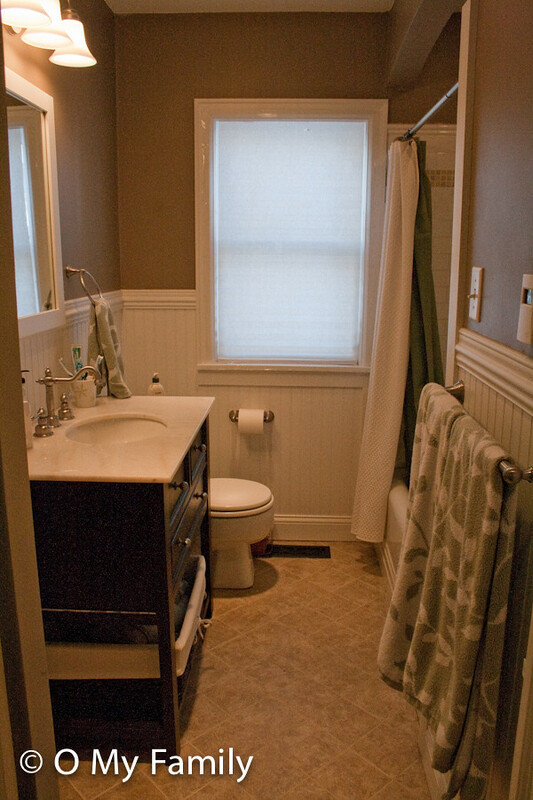 First off, I’m totally in love with that bathroom. 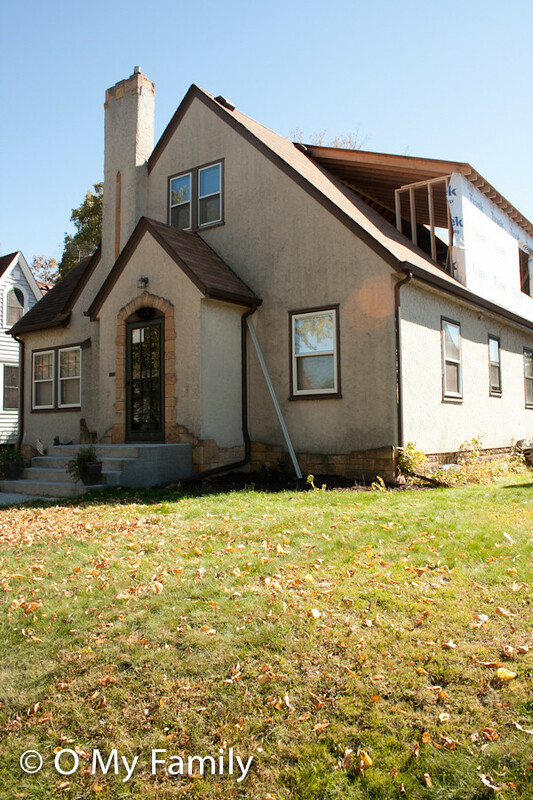 Second, I’m super jealous your renovation is happening at what seems like record speed (to me, who doesn’t have to live with a whole in my roof). Right now we’re still talking about maybe going down to look at getting carpet estimates for that master bedroom we plan on possibly making out of our 3rd floor. And my due date is only 11 weeks from now!! I need to get a post up about our bathroom because I thought that renovation would literally be the end of me, my marriage and sanity… then looking at yours I am amazed at 1) how handy O Family is 2) how well you handle the “mess”. Can’t wait to see finished pictures! Way to go!! I would have been hiding for sure! Can’t wait to see the next! Note to self, demolition causes fertility. Looking good! Looking good! But really, really wish you had included a photo of you wielding the saw. Really like your style, that bathroom is beautiful. The addition is shaping up nicely, good job! I am in no way showing these photos to my husband because he has thought about making our attic into another room but there is no dormer up there. I don’t want him thinking that he can just rip out a roof and put one in. Well, he probably could but like I said….he will never know. But I do look forward to hearing all about your renovation adventures! It’s looking GREAT! I can’t wait to see how it turned out!! I am so glad to see those outside pictures. I was having a hard time picturing the dormer. Lookin’ good! Y’all are FAST! So… you gonna put a nursery in there…? he he. Looking good so far!! I can’t wait to see more!! BTW, that’s a REALLY cute house you have there! Totally impressed! My husband laughed at me when I asked him to switch out the folding doors on the nursery closet for two french doors. So I can’t even imagine taking on a task this big!! Good job!!! Awesome in-laws! I LOVE the ‘new’ bathroom. My sister has the same tile that you did. It ws just so…PINK/PEACH! She started re-tiling hers and she STILL hasn’t finished, over 2 years later (going on 3 years). And that was just re-tiling. You and O-in-laws are VERY ambitious. 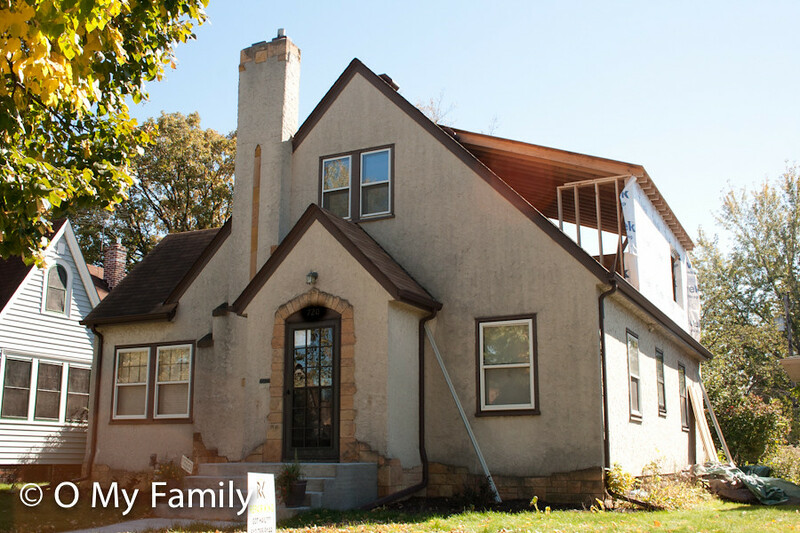 Good luck with this newest remodel…I’m sure it’s going to be GREAT! By the way, is it going to be the nursery? Or BabyO’s newest room? Or just a big play room for both OBaby and Gummy Bear? It would be a huge project for me – a really serious challenge. But it looks it’s going to be beautiful work in spite of all the mess that it’s causing. Hi! I stumbled upon your blog and I am so happy! I think you and your family are our kindred spirits in Minnesota. We were considering adding a dormer upstairs to our place and it would literally be identical to yours. I haven’t been able to find anything about it online until I read your blog. Thank YOU for posting!!! I was a bit older than you (28) and had 2 under 2 as well. They are now 4 and almost 3 and we are about to embark on the latest kitchen remodel. You are sooo inspiring, please keep posting!! !